Another Record! Another Great Success! 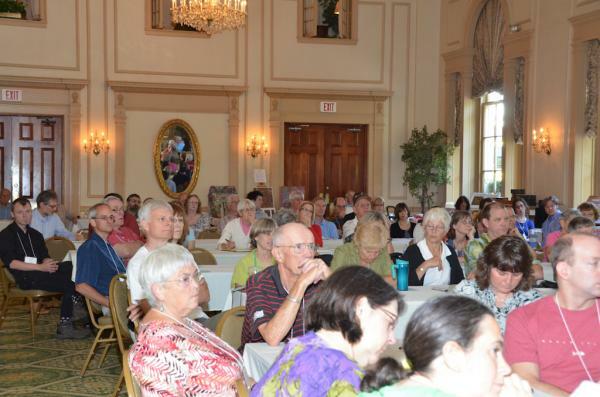 The Eleventh Puzzle Parley, a "specialty meeting" of the AGPC, was held at the Hawthorne Hotel in Salem, MA Thursday thru Sunday, July 19-22, 2012. 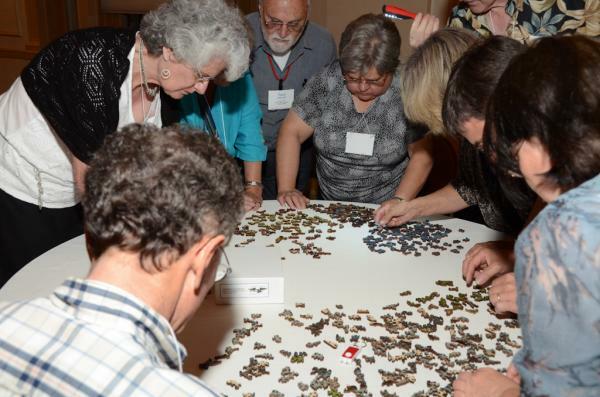 Nearly 120 jigsaw puzzle cutters, collectors, enthusiasts, dealers, restorers and friends attended part or all of the program. 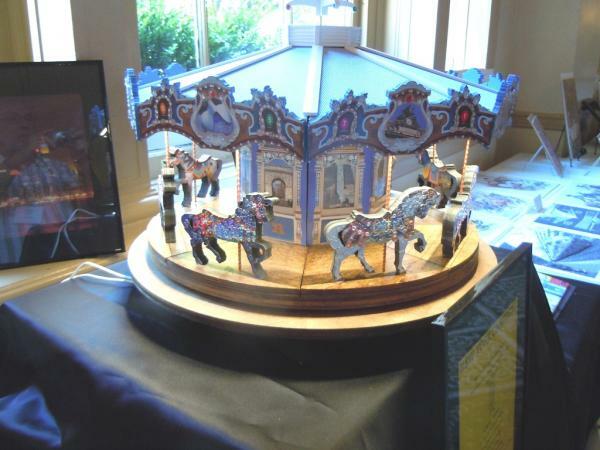 This broke the record set two years ago for the Tenth Puzzle Parley, also held at the Hawthorne Hotel in Salem. These two meetings are the largest gatherings of jigsaw puzzle people since the 1930s on this side of the Atlantic. 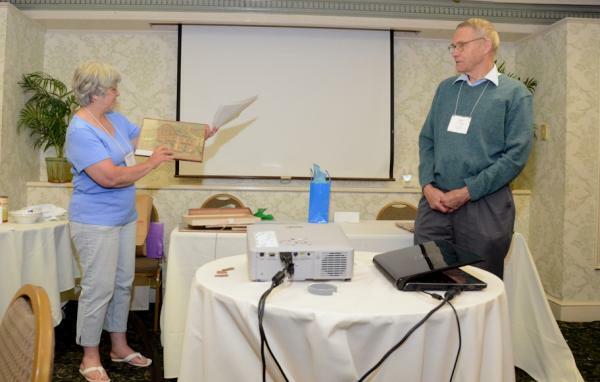 Bob Armstrong, "Oldpuzzles", Worcester, MA and Melinda Shebell, Jardin Puzzles, Stow, MA co-organized the meeting; Kelly Taylor of Durham, NC served as events planner. Realizing we might have such a large attendance, we had reserved the entire Hotel, including its Grand Ballroom for Friday and Saturday's events. The Parley began Thursday afternoon with an open house up at Anne Williams' home in Lewiston, ME. Anne is the leading collector, author, historian and lecturer of American jigsaw puzzles with a collection of thousands of puzzles and puzzle related items many of which few of us knew even existed (jigsaw puzzle pin ball machine?). Approximately 20 people made the trek up to Lewiston and were fascinated by the breadth and depth of Anne's collection. Then, on Friday afternoon, most of us made the short drive across town to Pride's Crossing for an open house at John Cabot's. The house, alone, was well worth visiting with its many large, airy rooms, recently converted from the main house of a large estate. John had brought in additional tables and spread his fine collection of puzzles throughout the first floor giving attendees plenty of room to walk around and view them. After a social hour and delicious buffet dinner at the Hawthorne Friday night, 34 of us participated in a giant Yankee swap (titled "White Elephant Swap") in which attendees contributed a wrapped puzzle ostensibly worth up to $100, and then each such attendee drew a number and successively selected and opened a puzzle from the pile. He/she could then exchange that puzzle for any puzzle already opened, until the last puzzle was drawn at which point the first person to have drawn could exchange his/her puzzle with any in the room. Complicated, yes, but it worked just fine thanks to Kathleen Pigeon, Pigeon Puzzles, Gorham, ME who organized the event, and was a lot of fun for all attendees at the Parley that night! After the Swap, most attendees adjourned to the Hotel Library to face the daunting task of assembling the many puzzles brought specially to test us. However, 21 cutters remained in the Grand Ballroom and participated in the Pagey Elliott Puzzle Exchange. Fourteen of these cutters had brought 14 of their own hand cut jigsaw puzzles to swap with 14 others while an ambitious 7 cutters had brought 21 puzzles to swap with all 21 participants. Anne Williams organized the Exchange and had figured out who swapped with whom, no mean task! 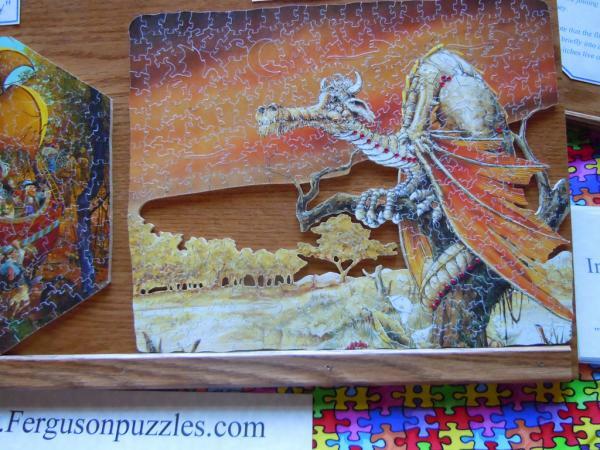 A super fast way to build a collection of puzzles cut by some of today's top makers. 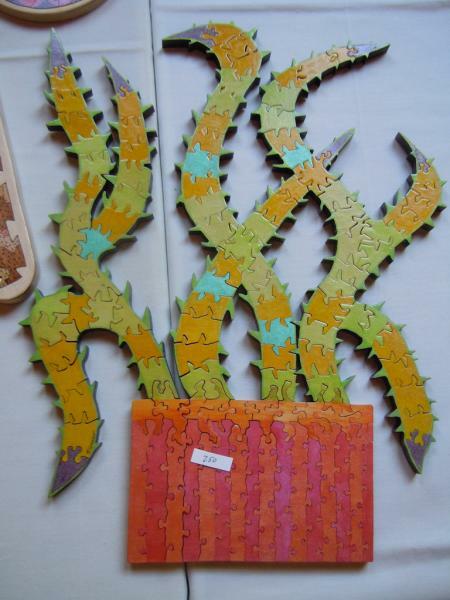 Each cutter was urged to use the same or similar image for his/her puzzles and to bring an extra to display. 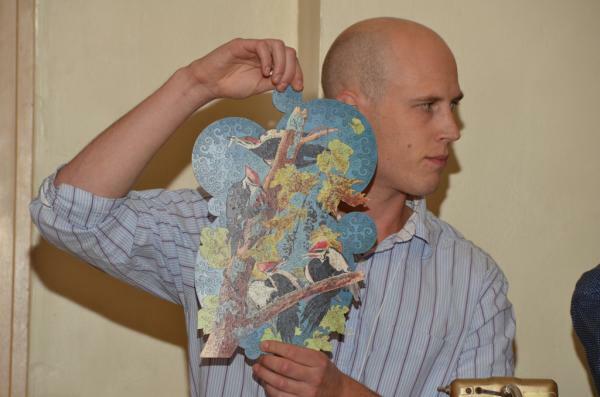 Each participants talked briefly to the group about his/her puzzle. Liz Platais, Pagey Elliott's daughter from Carlisle, MA displayed some of Pagey's puzzles and spoke about Pagey 's legacy ending with a symbolic toast of sherry. 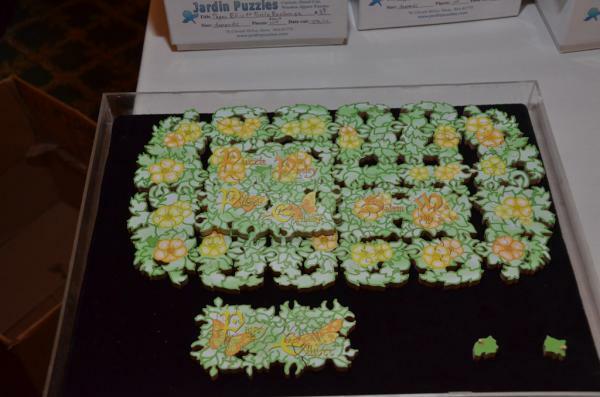 The next day the puzzles were displayed prominently in the Grand Ballroom and two different secret ballots conducted: one among the cutters for "Cutters' Choice" and one among the Parley attendees for "Best in Show". 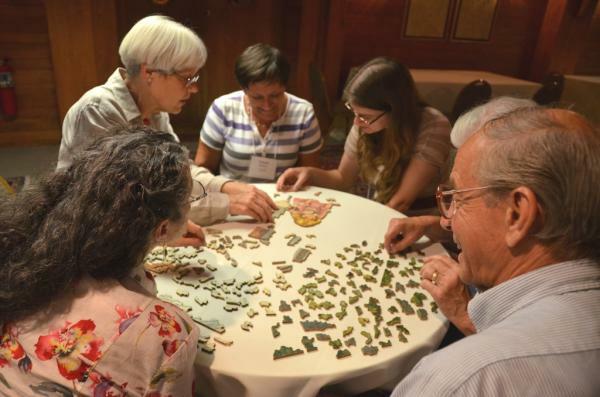 Most of the puzzle events were focused on Saturday, and the weekend attendees were joined by puzzlers who came just for that day swelling the crowd to well over 100. 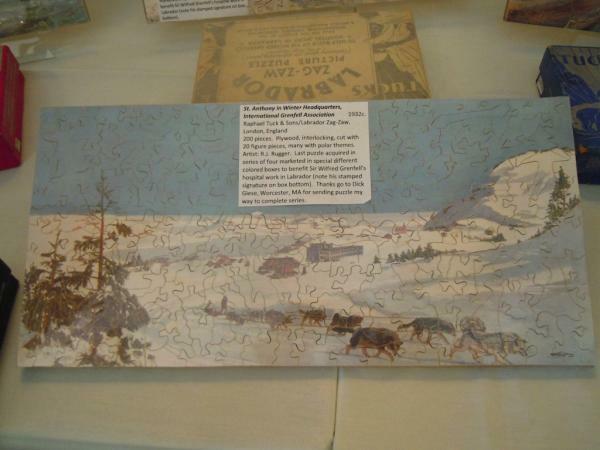 The room was lined with as many tables as could fit in and all table space was filled with jigsaw puzzles set out by cutters and collectors. Each Parley the sight becomes more magnificent, especially as the cutters extend their puzzle making into new areas with brilliant forms and colors. The meeting started with Bob Armstrong welcoming everyone and introductions around the room. 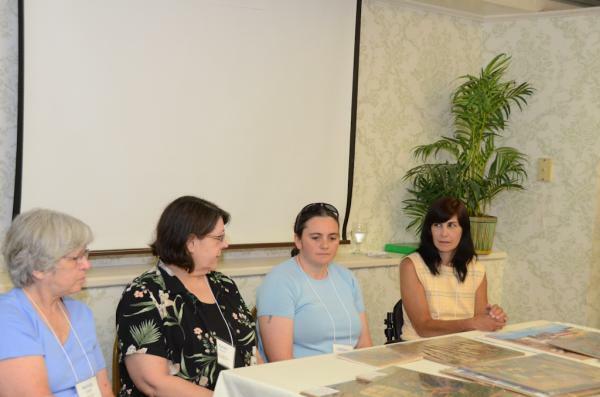 The first session was the "Cutters' Conversation". 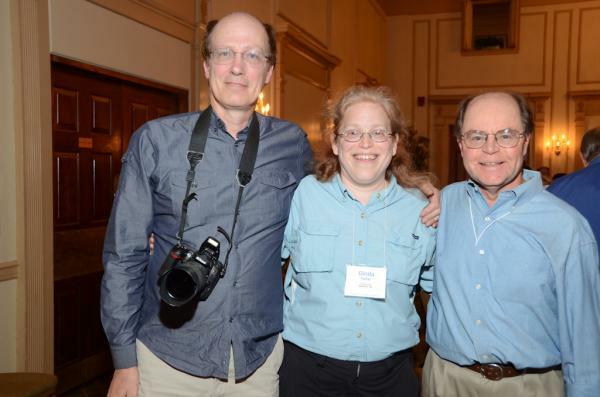 Several of the puzzle makers, who took part in the Cutter's Exchange, including Jesse Smith-Rosenberg, N-e-v-o-u-s Systems, Somerville, MA, John Stokes, Custom Puzzle Craft, San Diego, CA and Jeff Eldridge, Liberty Puzzles, Boulder, CO were asked to describe their puzzles and the special techniques used. Chris Yates, Baffler Puzzles, Boulder, CO described his work and painting techniques on layered tray puzzles. Using a flip chart filled with stick figures, Dee Rogers, Platinum Puzzles, Canaan, NH explained how she "engineers" her complicated standup figure pieces and combinations. Melinda Shebell, Jardin Puzzles, Worcester, MA talked about the finer points and tricks involved with color line cutting. The rest of the session was an open discussion of submitted topics. 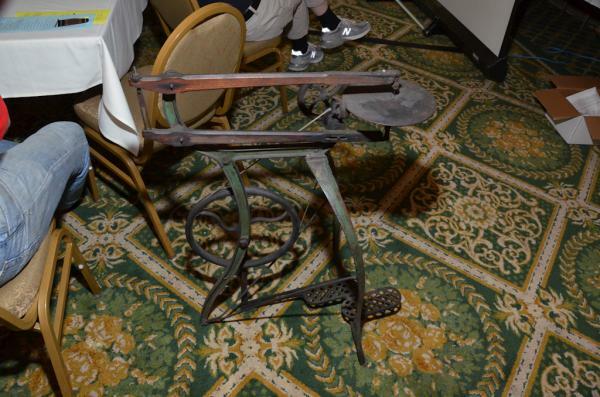 After "Cutters' Conversation" Joe Seymour, Depqua Puzzles, Rohnert Park, CA outlined the history and development of scroll saws starting back in the 19th century. 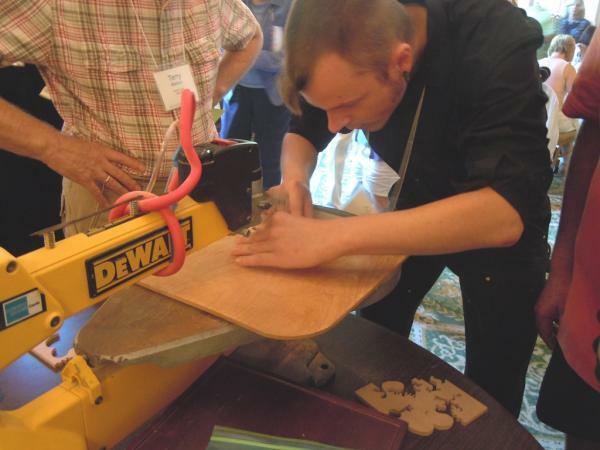 This led into the lunch break during which Mark Cappitella, MGC Puzzles, East Haddam, CT set up his scroll saw and gave cutting demonstrations; Mark's children were particularly adept at using the saw. Mark also set up a 19th century treadle scroll saw (owned by Bob Armstrong) and challenged anybody to see if they could operate it well enough to cut a decent puzzle piece. It turned out Mark probably won his own challenge as the rest of us found it most difficult to apply constant pressure to the foot treadle so as to keep the blade moving at an even speed against the wood. Boulter Plywood, Ben's Scroll Saw, and Friend Box Co. displayed examples of their plywood, blades and puzzle boxes and handed out free samples. The afternoon began with Collector's Corner. 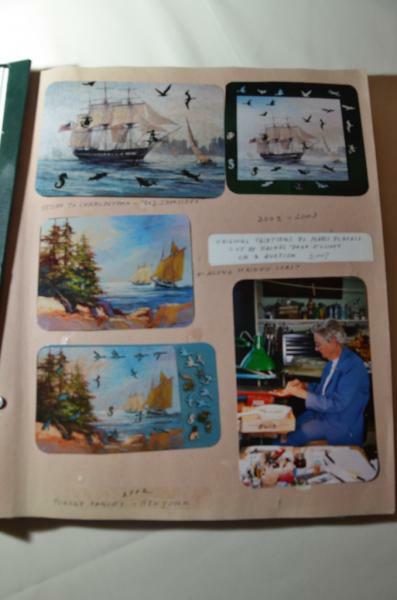 Veteran collectors, Graham & Kay Curtis from Kilbourne, IL, talked about how they started collecting jigsaw puzzles over 20 years ago, which quickly evolved into making replacement pieces and cutting new puzzles as well. Their best story was going back to a small Iowa town looking for more puzzles to add to some they had found marketed by a long out-of-business pharmacy. This actually led to finding a batch of missing pieces which completed the puzzles they already had! After the Curtises, Ann Eddins, Charlottesville, VA described how she got involved in buying the entire collection of over 1000 wood puzzles from the estate of Ann Bohner in North Caroline, and how she and Susan Marcell, also from Charlottesville, VA are organizing, cataloging and selling on Ebay puzzles from that estate under the seller's nomenclature, "sominva". Rob Jones, Greenwich, CT concluded the session by reporting on the status of the "mega-website" project which would allow anyone to upload and display his/her collection and search all the linked collections for information on puzzles. Rob asked the group if there was still interest in the project before proceeding further. Contact Rob ( ) to express your interest and support. Rob's session was followed by Show and Tell whose theme this year was Whales and Witches. Several attendees presented puzzles of both themes. 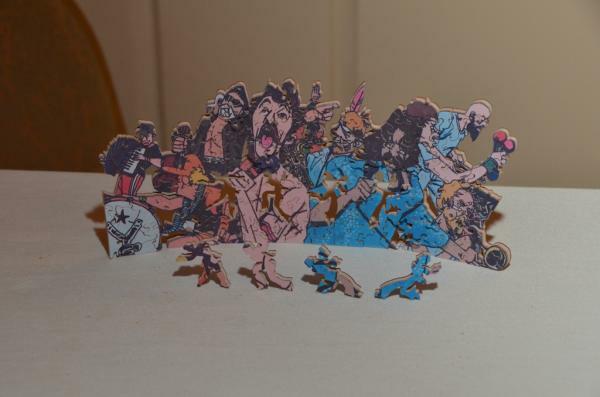 Bob Armstrong showed his latest completed collection of all four hard-to-find puzzles in the Labrador Zag-Zaw series made specially in the 1930s by Raphael Tuck & Sons, London, England. 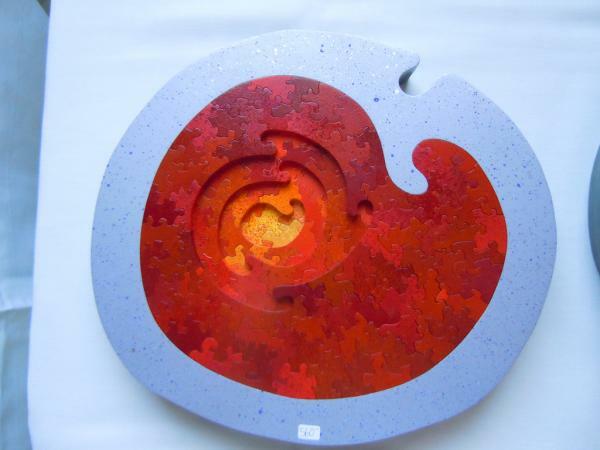 The puzzles featured figure pieces with Polar region themes and were intended to raise money for the medical mission of Sir Wilfred Grenfell to the native populations of Newfoundland and Labrador. This was followed by Table Sales during which many puzzles were bought and sold and cutters of new puzzles gained new customers for their work. After another social hour and excellent banquet meal including wine, Bob Armstrong introduced Chris Wirth from Liberty Puzzles in Boulder, CO. Chris described his family's connection in the 1930's with Falls Puzzles and the King of England and how that eventually led him to start his business of making laser cut puzzles. Then Chris asked the audience to form into teams of 3 or 4 and handed out copies of the same puzzle to each team. At the start signal, each team raced to see who could complete the puzzle first. The winning team consisted of : John Stokes, Custom Puzzle Craft, San Diego, CA, Ginda Fisher, Wellesley, MA and Phil Snyder, Shepherdstown, WV. A second night of puzzle assembling followed in the Hotel Library which was reserved for our sole use the entire weekend so we could store and leave out puzzles there. Following a continental breakfast Sunday morning, Bob Armstrong chaired a panel discussion about puzzle restoration which included Lisa Lee, Forgetmenot Puzzles, W. Winfeld, NY, Kathleen Pigeon, Pigeon Puzzles, Gorham, ME, Karen Morris, Aunt Ren's Puzzles, Casselberry, FL and Melinda Shebell, Jardin Puzzles, Stow, MA. Bob subjected the panelists to rapid fire questioning about their techniques with the panelists firing back answers as fast as the questions were asked. It turned out that Lisa Lee had devised different ways of making and coloring replacement pieces completely on her own; Bob and the other panelists ended up taking notes on how Lisa made her extraordinary replacements. Lisa, Kathleen and Karen are all willing to make replacement pieces for others for a modest fee. Then, Melinda led a discussion of the future of the parleys, pointing out that both Bob and herself were unable to continue to organize and manage them as in the past, and asked for volunteers to run the meetings and handle the many areas where help is needed. Please contact Melinda if you are interested in helping out in the future ( ). Finally, Melinda called up Betty Platais, Carlisle, MA to hand out puzzle ribbons to the winners of the best Exchange puzzles; John Stokes, San Diego, CA won the "Cutters' Choice" award voted on by the cutters themselves with Andrea Farnham, Thingamajigsaw Puzzles, Lebanon, NH a close second; Melinda Shebell won the "Best in Show" award voted on by the rest of the parley attendees with Anne Williams runner up. Melinda also presented Dee Rogers, Platinum Puzzles, Canaan, NH with a new award called the "Innovation Award" for her many ground breaking techniques shared over the last three parleys including: special pop-up pieces with shadows, complex 3d puzzles built from rearranging special pieces from a 2d puzzle, scented pieces from her Oz Limited Edition and more. Other awards: Dee Rogers cut and presented a beautiful puzzle to the Hawthorne Hotel; Melinda presented Kelly Taylor, our events planner from Durham, NC, a gift for her stellar work on the parley. 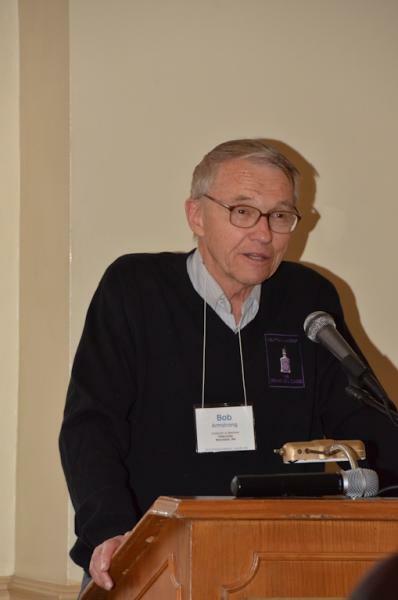 And Melinda Shebell thanked Bob Armstrong for his leadership in the Parleys with an extra copy of her Pagey Elliott Exchange puzzle, whereas Bob turned right around and gave Melinda an Arteno Special puzzle of the "Old Corner Book Store" in Boston, MA and a copy of a Boston Globe article describing the history of the building which still exists today. The last event at the Hotel was a screening of the 2010 Argentine feature film, "Puzzle", with sub-titles, supplied by Anne Williams in which a 50 year old housewife achieves independence, self-confidence, romance, and a tournament championship through jigsaw puzzles. Finally, for those who could stay around for the afternoon, Jeanne Speizer held an open house at her home in Rockport, MA overlooking Rockport Harbor. Jeanne put out a wonderful display of puzzles plus plenty of "goodies", and with the weather cooperating, the views of the Harbor from her house were magnificent! That concluded a 4 day weekend filled with many and varied jigsaw puzzle activities and record numbers of participants. From all accounts it was the most successful Parley ever but we seem to say that after every Parley!